Cryptanthus is a genus of plants found in the Bromeliaceae family. Cryptanthus bromeliads are unique in that they only grow terrestrially as opposed to many other bromeliads that can grow mounted on a substrate. The genus get its name from the Greek word meaning hidden flower. As opposed to other bromeliads that have very small root systems which only act as anchors, Cryptanthus has a more developed root system. Its roots can be expected to grow to at least the same width as its foliage. While their root systems are larger. a five or six inch pot should still provide adequate space for the plant to grow. Using plastic pots will help maintain moisture. It is wise to use a pot that is wider than it is deep. Earth Stars will thrive when potted in a medium that maintains some moisture. Specialty potting mixes are available at garden centers and nurseries. You can also mix your own with sand, peat and perlite. In order to maximize growth, Cryptanthus should be fertilized. Cryptanthus will thrive on any balanced fertilizer such as 10-10-10 or 14-14-14. It is important, however, to significantly dilute the solution down to a quarter of the strength recommended. This highly diluted solution can be used every time you water. The Cryptanthus Society recommends using a time release granular fertilizer when first planting pups. 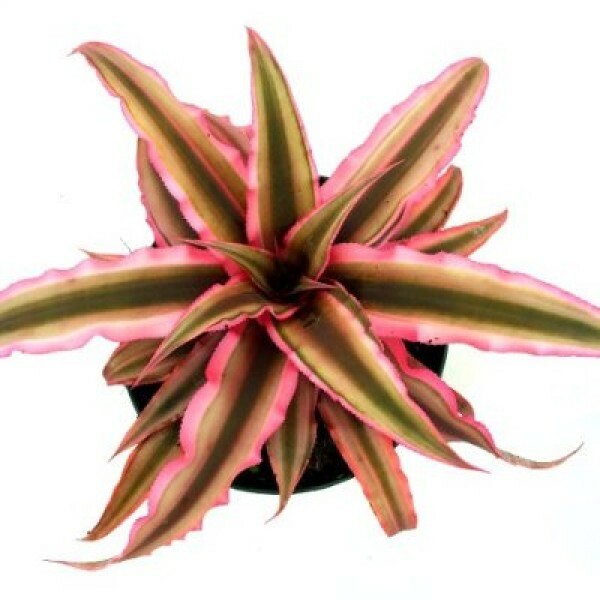 Cryptanthus varieties require differing amounts of lights. Most Cryptanthus prefer indirect sunlight. Shade from tall trees outdoors or a sunny room without direct sun exposure is ideal for Cryptanthus. As mentioned above, Cryptanthus are adapted to survive under the cover of trees in humid climates. Too much direct sun can cause bleached or sunburned areas on the plant’s leaves. If your plant seems stressed and these marks appear, move your bromeliad to a spot with less direct sunlight. On the other hand, if your plant does not get enough light it will begin to look light green in color.